Pimento cheese is a staple in the Southern United States, but in the last few years, it has been gaining popularity outside the South. 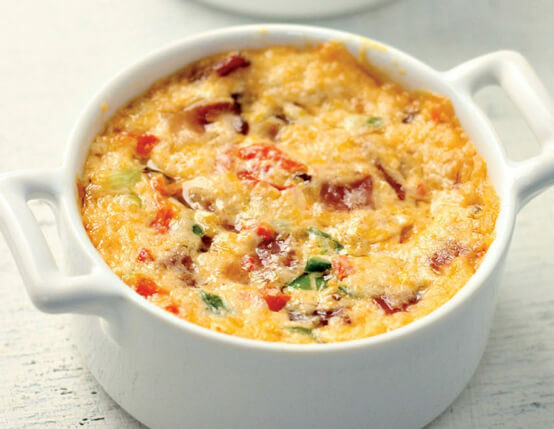 Here is an easy recipe where you can make your own pimento cheese spread with a bacony twist. Served with Ritz crackers, this is the perfect dip to be served as a appetizer for any given party.Enjoy! Cook bacon in a large deep skillet or sauté pan over medium heat until crisp. Transfer to paper towel; allow to cool and crumble. Evenly spread the mixture in an ovenproof 2-quart casserole dish. Bake for 25 minutes or until cheese is completely melted and bubbly. This entry was posted in Appetizers/Starters, Cheese, Gluten-Free, Pork and tagged Cheddar Cheese, Cheese, Dip, Gluten-Free, Jalapeño peppers, Pepper Jack Cheese, Scallions, Southern. Bookmark the permalink.